1. Observing how I spend my time and interacting by taking one photo on the hour each hour on a number of days. 2. Observing how we spend money by tracking our household incoming and outgoing for one week. Interacting by setting budgets so we can begin saving for summer holidays. 3. Observing the meals that we eat for one week and interacting the following week by thinking how I could make our meal times less hectic and our food shopping and diet even better. 4. Observing each room of my house, doing a quick PNI analysis (Positive, Negative, Interesting) and looking where I’d like to interact. Creating an action plan for each room with tasks to do ‘now’, ‘soon’ and ‘eventually’. I will try to tackle all the ‘nows’ this month. 5. Observing some gardens, either with site visits, from books or by browsing the internet. I hope this will inspire me to interact with my own garden and help me get through these dark, wet February days. Just to finish off, here is a totally unrelated photo, oh I guess it is me being ‘observed’ by my chicken. Her name is Smoky. 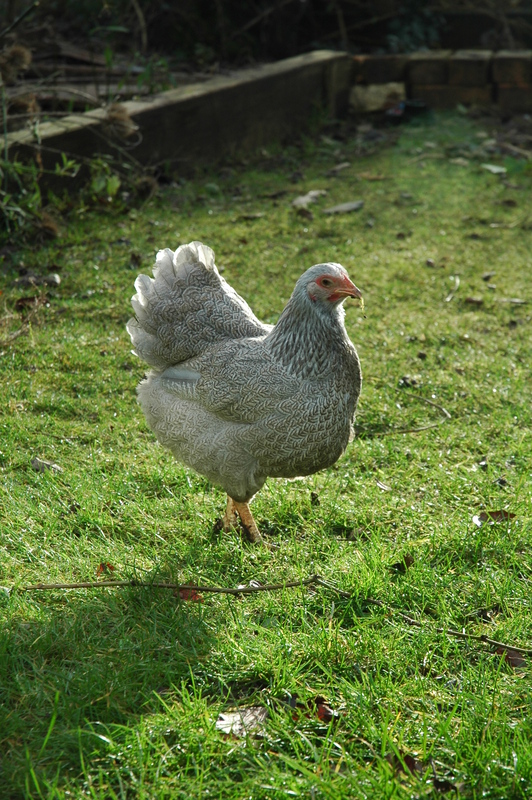 She is a grey/blue laced Wyandotte. We brought her as a tiny chick last summer. She is quite wary of people but very beautiful. This entry was posted in Uncategorized and tagged chickens, Observe and interact, Permaculture, Permaculture Diploma, Twelve principles for twelve months by emilycrofton. Bookmark the permalink. What a beautiful chicken. Love your goals for the month. Thanks, yes she is a beautiful girl, i am hoping she will start laying soon.